The low ebb of my Forest Service career was the two summers I spent working on the timber crew. It all became clear to me the summer I found myself back in the same stands of trees that I had surveyed the year before. Except this time I had a paint gun in my hand, and we were walking along the flag line where the road was going to be built. So all those stand exams in pristine tracts of timber led to clearcuts and shelterwoods. And roads, built at great expense to the American taxpayers. The country was in a boom cycle, under the leadership of Mr. Reagan. His interior secretary James Watt famously stated that we needed to extract as many natural resources as we could before Armageddon arrived. My paint gun and I were expected to say which trees stayed and which ones headed for the sawmill. The only way I could face each day was to tell myself that if it wasn’t me out there, it might be somebody who cared less. No consolation at all. The boom was coming to an end. The spotted owl wars were heating up, and the foresters were cranking out as many timber sales as they could before the Endangered Species Act shut them down. By this time, I had a permanent appointment as a fuels technician on the Wenatchee National Forest and had moved back to Washington. When the FS rejected my proposal to work part-time while I attended graduate school, I bailed out and went back to being a seasonal employee. I found myself a spot on the trail crew at the Cle Elum Ranger District. Great crew, great boss, great backcountry. In 1991, I made friends with Chester the Chainsaw, a heavy loud Stihl 038 that nobody else wanted to use or carry. My partner Maureen was newly pregnant, so she didn’t do any sawing. She carried the extra gas and oil, pounded wedges into kerfs for me, and cheered me up when I thought Chester was going to whip me into submission. We explored the trails together, and sometimes worked with Jon, John, and John. We were in the tent camping at Lemah Meadow when she felt the baby move the first time. (Tanner is now 19, our trail baby.) We spent many hours thinking up baby names. After that summer, Maureen went off to raise her family, but we have stayed in touch. I kept coming back to the trail crew, year after year. I finished my graduate degree, got married, started my career as a teaching and exhibiting artist. But summers were for the mountains. 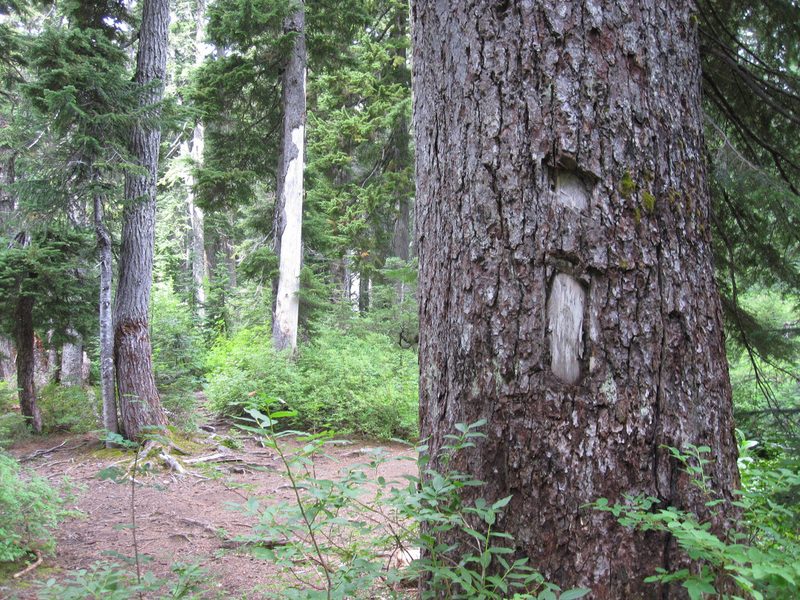 When trails were first built into the National Forests, the rangers used a special blaze. A long vertical rectangle was chopped into the bark of a tree with an axe, topped by a square. It was called the “dotted i” blaze. When you see the dotted i, you know you are on an official trail. For years I have followed these blazes, wondering about who made them. A ranger on horseback? Some old-time packer leading a packstring carrying lumber to a lookout site? A CCC trail crew in the 1930s? These dotted i’s connect me to the past, to trail crews of old who also repaired the telephone lines connecting lookouts and guard stations. The blazes tell stories of long, long days on foot or in the saddle, of fires fought, blown down trees hacked through, rocks blasted. Of hunting camps and prospectors. Of characters who named places like Paddy-Go-Easy Pass, Fortune Creek, and Spade Lake. I feel those stories when I’m working on the trails, but every year they become more distant as humans hurry in and out of the backcountry with cell phones and GPS. Some of the old unused trails get harder to find, because the blazed trees turn into snags and fall over. Brush grows over the tread, the paths grow so narrow they disappear. Sometimes an old switchback is evident in the right light, if you know where to look. I love these old trails. I love when the route-finding gets hard and I have to use all my senses to feel where the trail has gone. It’s a sixth sense, getting the rhythm of a trail and knowing where it is. I can hear the squeak of saddle leather, the clop of a shod hoof on a rock, the echo of an axe way off in the trees, the musical ring of a crosscut saw deep in a log. If those blazes could speak, what tales they could tell.